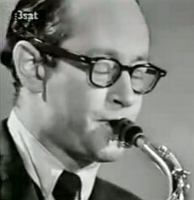 A man of quiet, dry and clever wit and urbanity, alto saxophonist Paul Desmond provided a strong voice to the Dave Brubeck Quartet for 16 years. His light, loping sound and graceful, understated swing were in marked contrast to pianist Brubeck's thunderous displays in the realm. Desmond's playing had a warmer, more mellow feel than one of his peers, Lee Konitz, whose sound held more jagged, arid qualities. Born in San Francisco on Nov. 25, 1924, Desmond was a clarinet student in high school and college. He began his efforts with Brubeck's octet in 1948-'50, but didn't join the pianist on a regular basis until 1951. That group rode the college circuit to fame and toured throughout the world. After departing the Brubeck quartet in 1967, Desmond began a freelance career that lasted until his death from cancer on May 30, 1977. During his final decade, he formed close playing associations with guitarist Jim Hall and baritone saxophonist Gerry Mulligan. "I think I had it in the back of my mind that I wanted to sound like a dry martini." some of his and the pianist's first efforts together. "I was mostly screeching away at the top of the alto and Dave appeared to be playing Bartok with his right hand and Milhaud with his left," he said. "Together, we could empty any club in half an hour with no mention of the word 'fire.'" In 1977, Desmond was elected by the Readers into the Down Beat Hall of Fame.